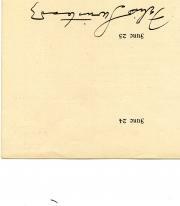 Autograph signature ('Henry J. Wood') with publicity photo. Undated, but after his knighthood in 1911. 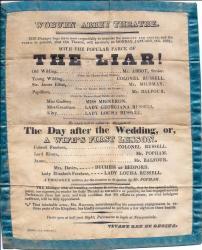 On a leaf (roughly 21.5 x 14) removed from a programme. Grubby, worn and with a central vertical fold. 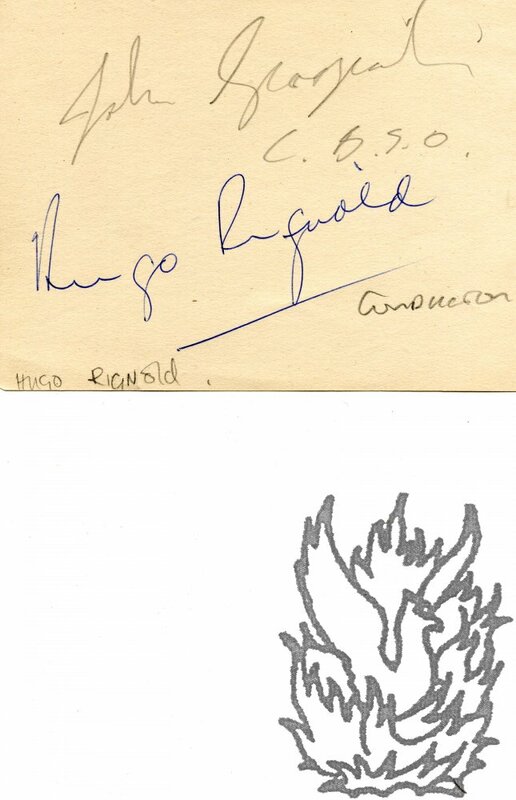 Laid down on a leaf (22 x 18 cm, and ruckled and spotted) removed from an autograph album. 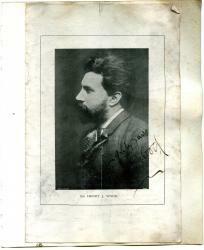 The autographed page only carries Wood's photographic portrait (12.5 x 8 cm), captioned 'Sir Henry J. Wood'). 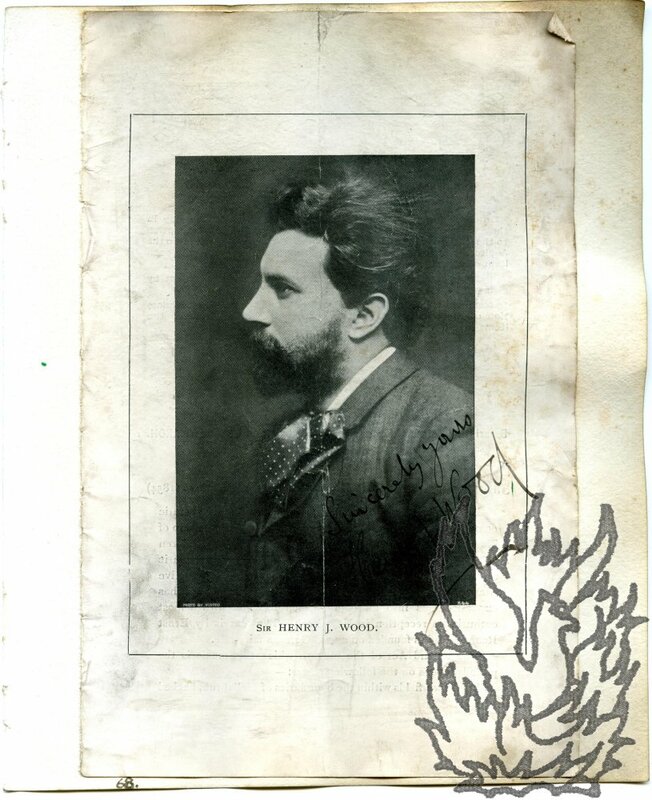 Bold signature in bottom right-hand corner of photograph: 'Sincerely yours | Henry J. Wood'. 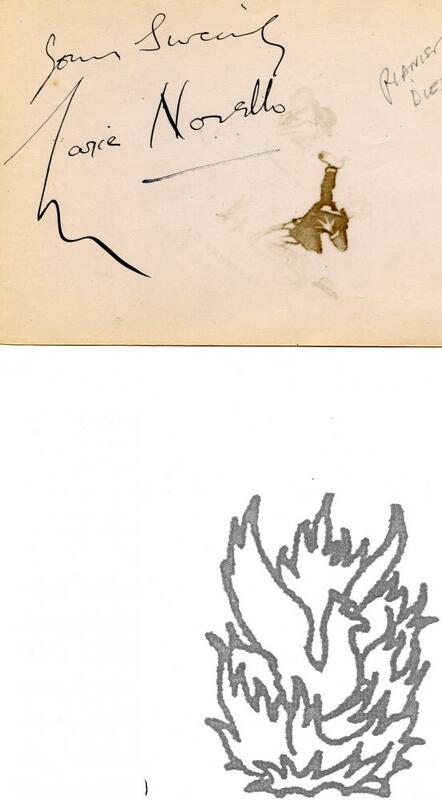 On one side of a leaf (roughly 11 x 16 mm), removed from an autograph album. 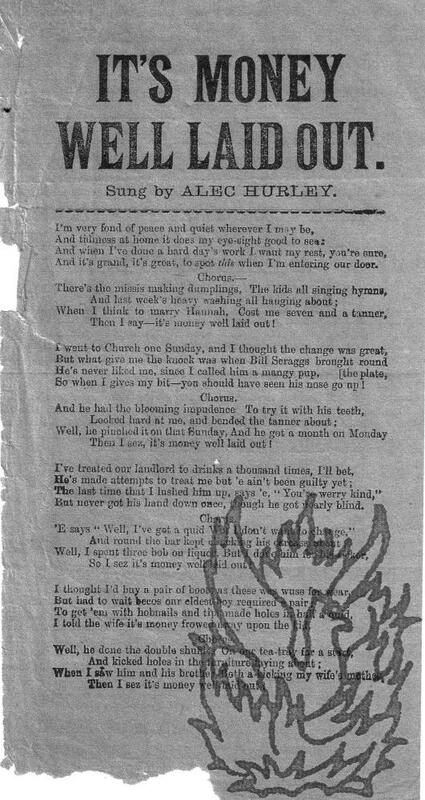 Good, on lightly aged paper, with some show-through from amusing drawing on reverse by L. E. H. Phipson. Bold signature reads 'Yours Sincerely | Marie Novello'. Drawing on reverse depicts a monocled old fogey protesting his love to a pretty young thing regarding herself in a handmirror. Captioned 'I'd rather be a young man's slave!' Signed by the illustrator 'L. E. H. Phipson | 6/12/1917'. Docketed in pencil. 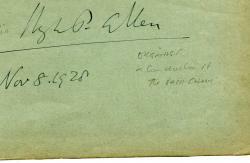 Autograph Signature ('Hugh P. Allen'). 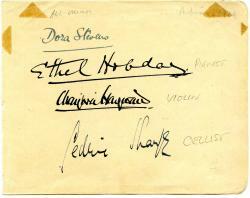 On a light-green leaf (11 x 14 cm) removed from an autograph album. Lightly aged and creased. Reads 'Hugh P. Allen | Nov 8. 1928'. Lightly docketed in pencil. 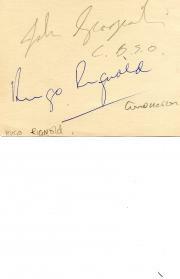 Two other autographs on reverse. 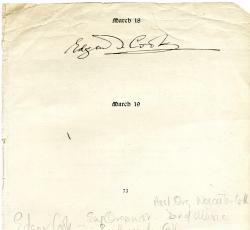 Autograph Signature ('Edgar T. Cook'). On piece (15 x 16 cm) of laid-paper cut from a page of a diary. Creased and worn at head. 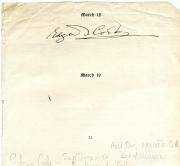 Signature under heading 'March 18'. Lightly docketed in pencil. On piece of laid paper paper (roughly 11 x 16 cm) cut from diary. Good, on lightly-aged paper. Under the heading 'June 25'. 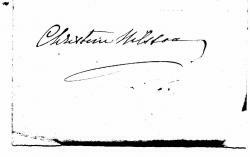 Autograph Signature ('B. J. Dale'). 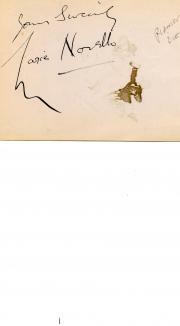 On piece of laid paper (roughly 8.5 x 16 cm) cut from diary. On aged paper with wear and 1 cm closed tear at head. 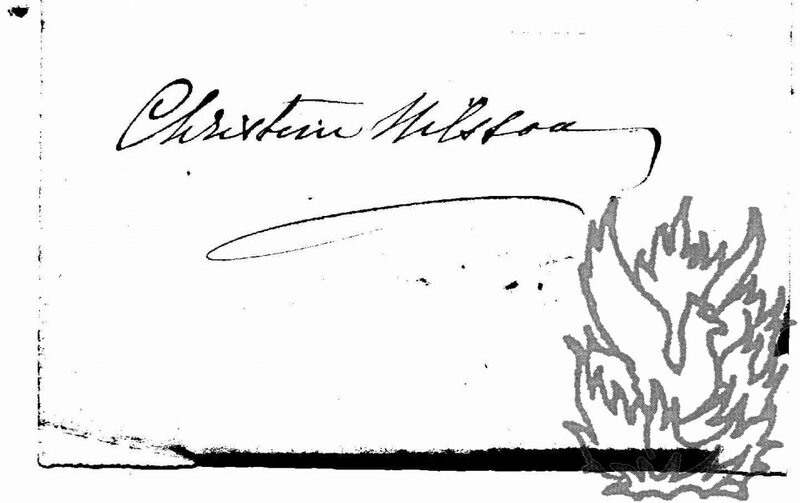 Clear and clean signature, beneath the heading 'July 17'. 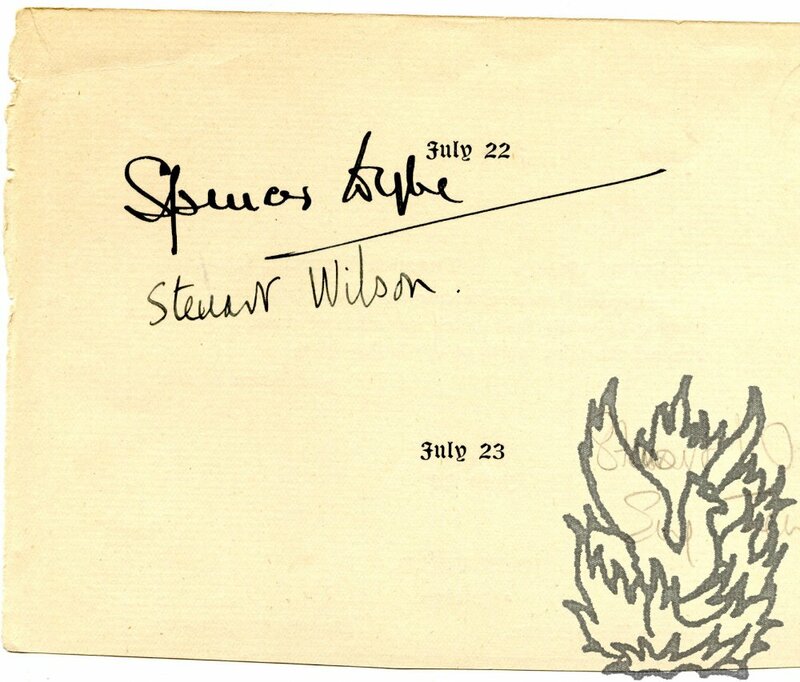 Autograph Letter Signed to "William Lyster", operatic entrepreneur, introduced Wagner to Australia. 12 Buckingham Street, Strand, WC [London}, 28 Oct. 1880. One page, 8vo, grubby but text clear and complete. He introduces a colleague from his Green Room, Frederick Mervin, whom he describes as a good fellow as well as an actor and singer of ability. He hopes his correspondent will make Mervin's "trip to the Colonies pleasant to him (presumably Australia) . "I hear all the news about you from your brother Alfie when I meet him. I trust this new venture will be hugely successful." Note: Lyster opened in Melbourne with a new company but died in Nov. 1880, presumably shortly after receiving this letter. Dimensions of paper 3 x 8 cm. Good, firm signature, on lightly aged and spotted paper. 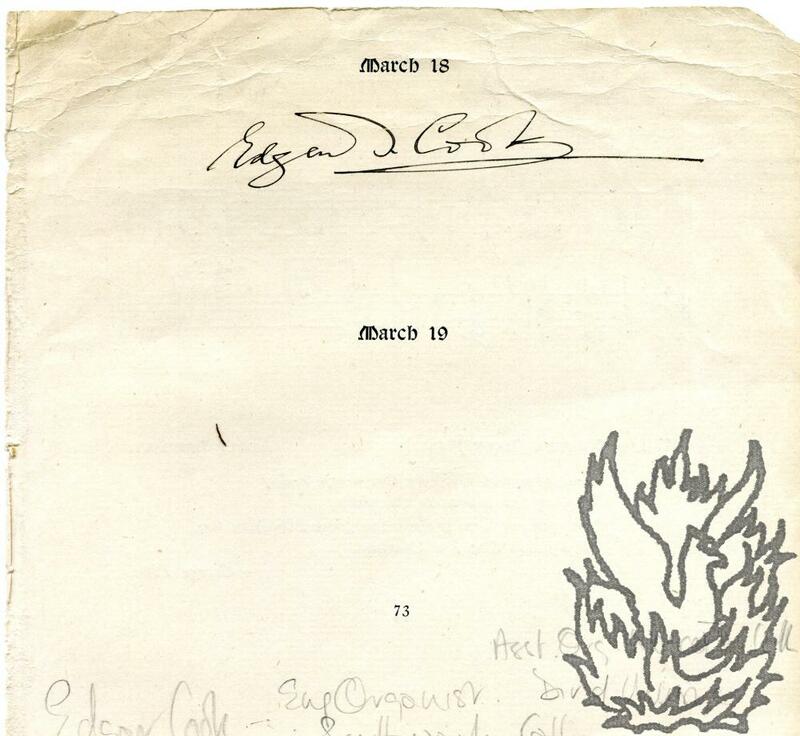 The flourish beneath the signature (paraph) has been cropped. Catalogue of a Valuable and Interesting Collection of Books formed by a Prominent American Playwright, [i.e. 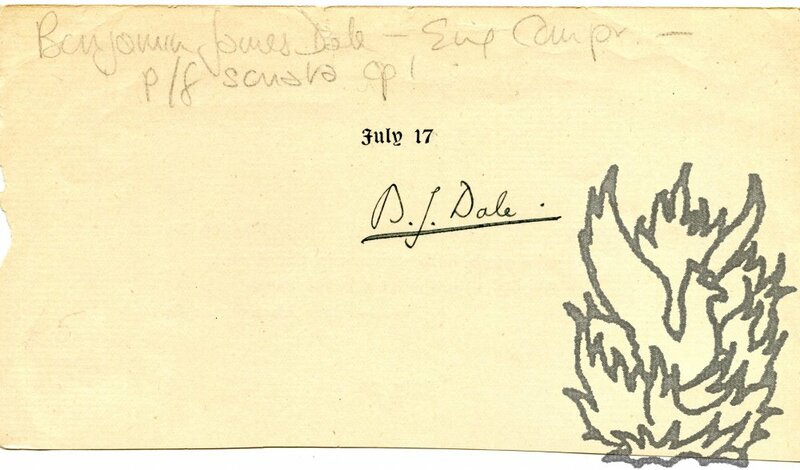 Daly] [...] relating to the Drama [...] Original Drawings. Including [...] A Very Valuable Series by W. Blake, Etc., Etc. Octavo: viii + 201 pages. Good and tight, on aged high-acidity paper, with some chipping and a little light staining at foot. A few pencil marks. In original printed grubby and chipped wraps cloth-taped to spine. Front wrap annotated in pencil. Four-page introduction entitled 'A PLAYWRIGHT'S WORKING LIBRARY.' Even considering the importance and interest of the theatrical collection, the high point is undoubtedly item 102: 'BLAKE, WILLIAM. ORIGINAL DRAWINGS IN WATER COLOURS and INDIA INK by the celebrated WILLIAM BLAKE (Pictor Ignotus). 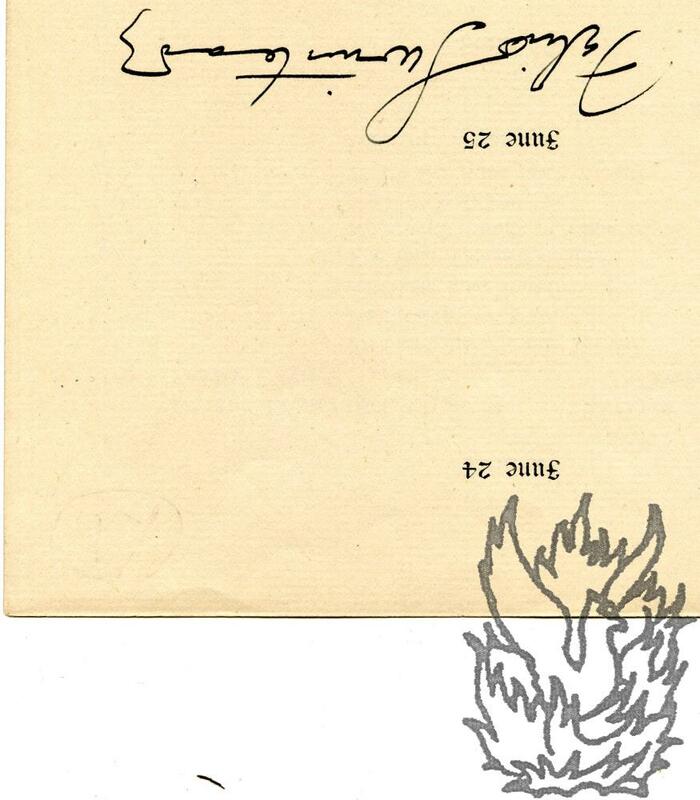 Autograph Letter Signed, in French, to unnamed male correspondent. Vendredi 11 Mars' [no year]; 23 Bentinck Street, Manchester Square, London. 12mo, 2 pp. 12 lines of text. Creased and ruckled, with a little smudging. Difficult hand. Asking the recipient 'd'aller passer une soirée avec nous'. 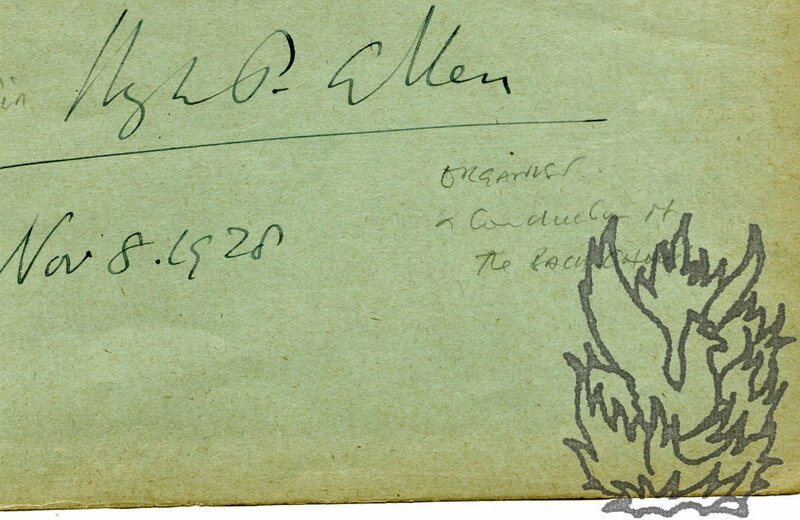 Laid down on a piece of paper which is attached to the blank reverse of the second leaf of the bifolium is a slip of paper (roughly 2 x 9 cm) carrying Eastlake's signature ('always truly yours | [signed] C. L. Eastlake'). One page, c.10 x 13cm, creased and dulled but text clear and complete. "Mon cher ami/ Voila tout ce wue j'ai et prenez garde d'egarer ce scenario du second acte - je n'en ai pas d'autre copie et s'il la perdait, je ne pourrai jamais me rappeler un seul mot du contiens.- / Mille [?] 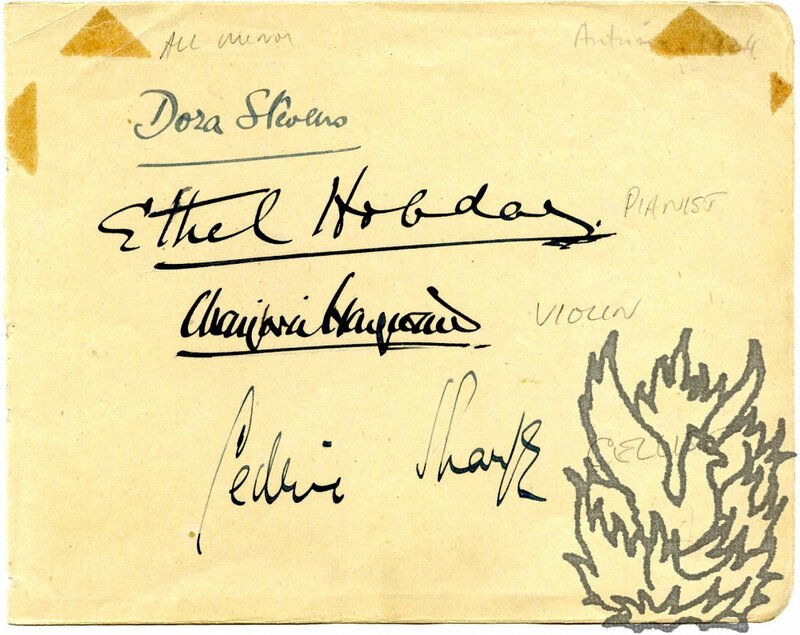 tendres amitiés et remerciements de votre aimable billet -"
Autograph Letter Signed, in French, to an unnamed male concert promoter. 25 September 1842; 148 rue Montmartre, Paris. 12mo, 2 pp. 22 lines of text. Very good on aged paper. Text clear and entire. Replying on behalf of 'Mlle Lia Duport, ma fille' (who accepts the 'offre flatteuse') and 'Mr. 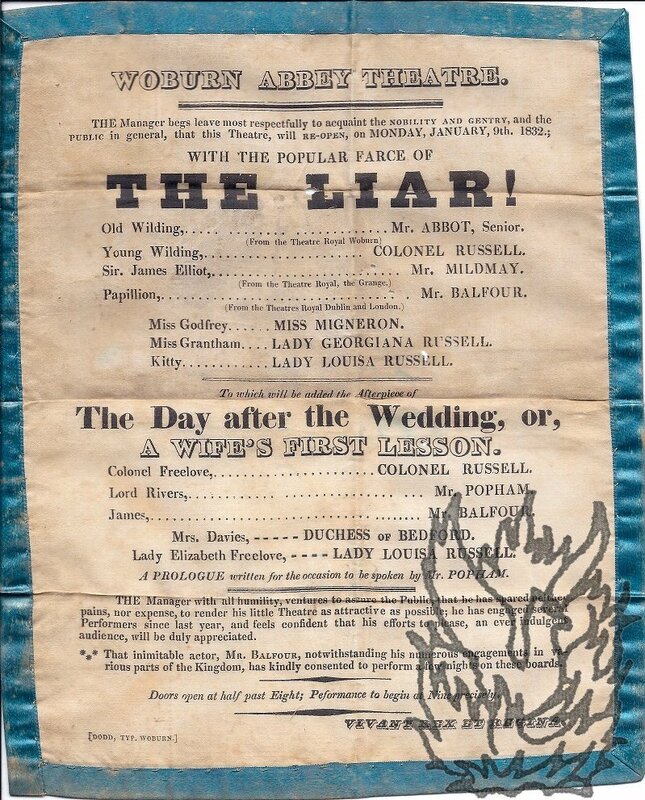 Alizard' (who has not yet returned from Brussells, where he is 'engagé au théâtre de la Monnaie'). If Alizard is available his fee will be the same as Duport's daughter's. States the reduced fee for which his daughter will sing alone, 'Dans le cas où Mr.
No date (1923? ); Dublin: Martin Lester Limited. 4to. 24 pages. In original brown printed wraps. In poor condition: paper frayed, worn and discoloured, front and back wrap separately detached. Number 97 of 350 copies. Pollock (1887-1964) was a novelist, poet and one of the founders of the Gate Theatre. Autograph Note Signed ('Herman C. Merivale') to the London publisher Samuel French. With a printed subscription form, filled in by Merivale. 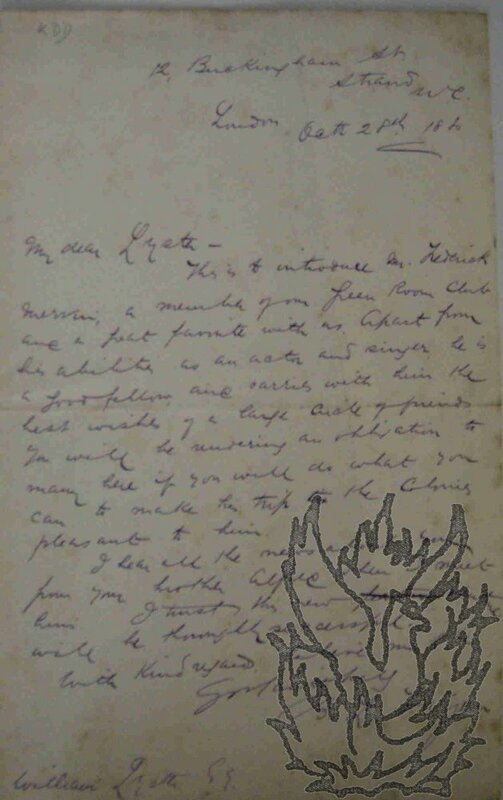 Letter: 25 April 1879; on embossed letterhead of the Union Club, Brighton. Subscription form: undated. Letter: 12mo, 1 p. Grubby and stained. He 'did not mention the Planché-affair' in his letter of the day before. Asks for his name to be put down 'for a copy of the book' [French's edition of Planché's 'Extravaganzas']. 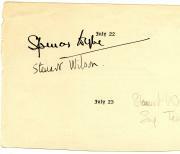 The subscription form (12mo, 1 p), heavily worn and with loss to the extremities, is laid down on the reverse of the letter. On it Merivale gives his address as 'Barton Lodge, Kingston on Thames'. 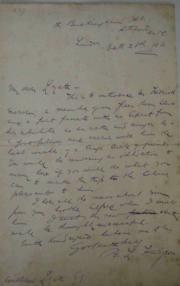 Autograph Letter Signed ('Robt Buchanan') to Fenn. 18 December [no year]; 5 Larkhill Rise, Clapham.